Thermocouple plugged to a multimeter displaying room temperature in °C. In electrical engineering and industry, thermocouples are a widely used type of temperature sensor and can also be used as a means to convert thermal potential difference into electric potential difference. They are cheap and interchangeable, have standard connectors, and can measure a wide range of temperatures. They measure the temperature difference between two points, not absolute temperature. Their main limitation is accuracy: System errors of less than one Kelvin (K) can be difficult to achieve. In 1821, the German–Estonian physicist Thomas Johann Seebeck discovered that when any conductor (such as a metal) is subjected to a thermal gradient, it will generate a voltage. This is now known as the thermoelectric effect or Seebeck effect. 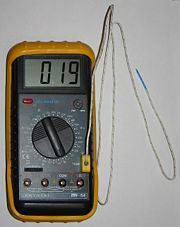 Any attempt to measure this voltage necessarily involves connecting another conductor to the "hot" end. This additional conductor will then also experience the temperature gradient, and develop a voltage of its own which will oppose the original. Fortunately, the magnitude of the effect depends on the metal in use. Using a dissimilar metal to complete the circuit creates a circuit in which the two legs generate different voltages, leaving a small difference in voltage available for measurement. That difference increases with temperature, and can typically be between 1 and 70 microvolts per degree Celsius (µV/°C) for the modern range of available metal combinations. Certain combinations have become popular as industry standards, driven by cost, availability, convenience, melting point, chemical properties, stability, and output. This coupling of two metals gives the thermocouple its name. Thermocouples measure the temperature difference between two points, not absolute temperature. In traditional applications, one of the junctions—the cold junction—was maintained at a known (reference) temperature, while the other end was attached to a probe. Having available a known temperature cold junction, while useful for laboratory calibrations, is simply not convenient for most directly connected indicating and control instruments. They incorporate into their circuits an artificial cold junction using some other thermally sensitive device, such as a thermistor or diode, to measure the temperature of the input connections at the instrument, with special care being taken to minimize any temperature gradient between terminals. Hence, the voltage from a known cold junction can be simulated, and the appropriate correction applied. This is known as cold junction compensation. Additionally, a device can perform cold junction compensation by computation. It can translate device voltages to temperatures by either of two methods. It can use values from look-up tables or approximate using polynomial interpolation. A thermocouple can produce current, which means it can be used to drive some processes directly, without the need for extra circuitry and power sources. For example, the power from a thermocouple can activate a valve when a temperature difference arises. The electric power generated by a thermocouple is a conversion of the heat energy that one must continuously supply to the hot side of the thermocouple to maintain the electric potential. The flow of heat is necessary because the current flowing through the thermocouple tends to cause the hot side to cool down and the cold side to heat up (the Peltier effect). Thermocouples can be connected in series with each other to form a thermopile, where all the hot junctions are exposed to the higher temperature and all the cold junctions to a lower temperature. The voltages of the individual thermocouples add up, allowing for a larger voltage and increased power output, thus increasing the sensitivity of the instrumentation. With the radioactive decay of transuranic elements providing a heat source this arrangement has been used to power spacecraft on missions too far from the Sun to utilize solar power. Thermocouple materials are available in several different metallurgical formulations per type, such as: (listed in decreasing levels of accuracy and cost) Special limits of error, Standard, and Extension grades. Extension grade wire is less costly than dedicated thermocouple junction wire and it's usually specified for accuracy over a more restricted temperature range. Extension grade wire is used when the point of measurement is farther from the measuring instrument than would be financially viable for standard or special limits materials, and has a very similar thermal coefficient of EMF for a narrow range (usually encompassing ambient). In this case, a standard or special limits wire junction is tied to the extension grade wire outside of the area of temperature measurement for transit to the instrument. Since most modern temperature measuring instruments that utilize thermocouples are electronically buffered to prevent any significant current draw from the thermocouple, the length of the thermocouple or extension wire is irrelevant. Changes in metallurgy along the length of the thermocouple (such as termination strips or changes in thermocouple type wire) will introduce another thermocouple junction which affects measurement accuracy. Also, in the United States, industry standards are that the thermocouple color code is used for the insulation of the positive lead, and red is the negative lead. The coefficients an are given for N from zero to between five and nine. To achieve accurate measurements the equation is usually implemented in a digital controller or stored in a look-up table. Some older devices use analog filters. A variety of thermocouples are available, suitable for different measuring applications. They are usually selected based on the temperature range and sensitivity needed. Thermocouples with low sensitivities (B, R, and S types) have correspondingly lower resolutions. Other selection criteria include the inertness of the thermocouple material, and whether or not it is magnetic. The thermocouple types are listed below with the positive electrode first, followed by the negative electrode. S and K type thermocouples, the S one is partially sheathed with an alundum tube. Type K (chromel–alumel) is the most commonly used for general purpose thermocouple. It is inexpensive and, owing to its popularity, available in a wide variety of probes. They are available in the −200 °C to +1350 °C range. The type K was specified at a time when metallurgy was less advanced than it is today and, consequently, characteristics vary considerably between examples. Another potential problem arises in some situations since one of the constituent metals, nickel, is magnetic. One characteristic of thermocouples made with magnetic material is that they undergo a step change when the magnetic material reaches its Curie point. This occurs for this thermocouple at 354°C. Sensitivity is approximately 41 µV/°C. Type E (chromel–constantan) has a high output (68 µV/°C) which makes it well suited to cryogenic use. Additionally, it is non-magnetic. Type J (iron–constantan) is less popular than type K due to its limited range (−40 to +750 °C). The main application is with old equipment that cannot accept modern thermocouples. The Curie point of the iron (770 °C) causes an abrupt change to the characteristic and it is this that provides the upper temperature limit. Type J thermocouples have a sensitivity of about 50 µV/°C. Type N (nicrosil–nisil) thermocouples are suitable for use at high temperatures, exceeding 1200 °C, due to their stability and ability to resist high temperature oxidation. Sensitivity is about 39 µV/°C at 900°C, slightly lower than type K. Designed to be an improved type K, it is becoming more popular. Types B, R, and S thermocouples use platinum or a platinum–rhodium alloy for each conductor. These are among the most stable thermocouples, but have lower sensitivity, approximately 10 µV/°C, than other types. The high cost of these makes them unsuitable for general use. Generally, type B, R, and S thermocouples are used only for high temperature measurements. Type B thermocouples use a platinum–rhodium alloy for each conductor. One conductor contains 30% rhodium while the other conductor contains 6% rhodium. These thermocouples are suited for use at up to 1800 °C. Type B thermocouples produce the same output at 0 °C and 42 °C, limiting their use below about 50 °C. Type R thermocouples use a platinum–rhodium alloy containing 13 percent rhodium for one conductor and pure platinum for the other conductor. Type R thermocouples are used up to 1600 °C. Type S thermocouples use a platinum–rhodium alloy containing 10 percent rhodium for one conductor and pure platinum for the other conductor. Like type R, type S thermocouples are used up to 1600 °C. In particular, type S is used as the standard of calibration for the melting point of gold (1064.43 °C). Type T (copper–constantan) thermocouples are suited for measurements in the −200 to 350 °C range. Often used as a differential measurement since only copper wire touches the probes. Since both conductors are non magnetic, there is no Curie point and thus no abrupt change in characteristics. Type T thermocouples have a sensitivity of about 43 µV/°C. Type C (tungsten 5 percent rhenium—tungsten 26 percent rhenium) thermocouples are suited for measurements in the 0 °C to 2320 °C range. This thermocouple is well-suited for vacuum furnaces at extremely high temperatures and must never be used in the presence of oxygen at temperatures above 260 °C. Type M thermocouples use a nickel alloy for each wire. The positive wire contains 18 percent molybdenum while the negative wire contains 0.8 percent cobalt. These thermocouples are used in the vacuum furnaces for the same reasons as with type C. Upper temperature is limited to 1400 °C. Though it is a less common type of thermocouple, look-up tables to correlate temperature to EMF (milli-volt output) are available. In chromel-gold/iron thermocouples, the positive wire is chromel and the negative wire is gold with a small fraction (0.03–0.15 atom percent) of iron. It can be used for cryogenic applications (1.2–300 K and even up to 600 K). Both the sensitivity and the temperature range depends on the iron concentration. The sensitivity is typically around 15 µV/K at low temperatures and the lowest usable temperature varies between 1.2 and 4.2 K.
The table below describes properties of several different thermocouple types. Within the tolerance columns, T represents the temperature of the hot junction, in degrees Celsius. For example, a thermocouple with a tolerance of ±0.0025×T would have a tolerance of ±2.5 °C at 1000 °C. B +200 to +1700 0 to +1820 Not Available ±0.0025×T between 600 °C and 1700 °C No standard use copper wire No standard use copper wire Not defined. Chromel/AuFe −272 to +300 n/a Reproducibility 0.2% of the voltage; each sensor needs individual calibration. Thermocouples are most suitable for measuring over a large temperature range, up to 1800 °C. They are less suitable for applications where smaller temperature differences need to be measured with high accuracy, for example the range 0–100 °C with 0.1 °C accuracy. For such applications, thermistors and resistance temperature detectors are more suitable. Type B, S, R, and K thermocouples are used extensively in the steel and iron industries to monitor temperatures and chemistry throughout the steel making process. Disposable, immersible, type S thermocouples are regularly used in the electric arc furnace process to accurately measure the steel's temperature before tapping. The cooling curve of a small steel sample can be analyzed and used to estimate the carbon content of molten steel. Many gas-fed heating appliances such as ovens and water heaters make use of a pilot light to ignite the main gas burner as required. If the pilot light becomes extinguished for any reason, there is the potential for un-combusted gas to be released into the surrounding area, thereby creating both risk of fire and a health hazard. To prevent such a danger, some appliances use a thermocouple as a fail-safe control to sense when the pilot light is burning. The tip of the thermocouple is placed in the pilot flame. The resultant voltage, typically around 20 mV, operates the gas supply valve responsible for feeding the pilot. So long as the pilot flame remains lit, the thermocouple remains hot and holds the pilot gas valve open. If the pilot light goes out, the temperature will fall along with a corresponding drop in voltage across the thermocouple leads, removing power from the valve. The valve closes, shutting off the gas and halting this unsafe condition. Some systems, known as millivolt control systems, extend this concept to the main gas valve as well. Not only does the voltage created by the pilot thermocouple activate the pilot gas valve, it is also routed through a thermostat to power the main gas valve as well. Here, a larger voltage is needed than in a pilot flame safety system described above, and a thermopile is used rather than a single thermocouple. Such a system requires no external source of electricity for its operation and so can operate during a power failure, provided all the related system components allow for this. Note that this excludes common forced air furnaces because external power is required to operate the blower motor, but this feature is especially useful for un-powered convection heaters. A similar gas shut-off safety mechanism using a thermocouple is sometimes employed to ensure that the main burner ignites within a certain time period, shutting off the main burner gas supply valve should that not happen. Out of concern for energy wasted by the standing pilot, designers of many newer appliances have switched to an electronically controlled pilot-less ignition, also called intermittent ignition. With no standing pilot flame, there is no risk of gas buildup should the flame go out, so these appliances do not need thermocouple-based safety pilot safety switches. As these designs lose the benefit of operation without a continuous source of electricity, standing pilots are still used in some appliances. Thermopiles are used for measuring the intensity of incident radiation, typically visible or infrared light, which heats the hot junctions, while the cold junctions are on a heat sink. It is possible to measure radiative intensities of only a few μW/cm2 with commercially available thermopile sensors. For example, some laser power meters are based on such sensors. Thermocouples can generally be used in the testing of prototype electrical and mechanical apparatus. For example, switchgear under test for its current carrying capacity may have thermocouples installed and monitored during a heat run test, to confirm that the temperature rise at rated current does not exceed designed limits. Thermopiles can also be applied to generate electricity in radioisotope thermoelectric generators. ↑ Temperatures, Thermocouple temperature sensors. Retrieved December 19, 2008. ↑ Omega Engineering, Thermocouples—An Introduction. Retrieved December 19, 2008. ↑ 3.0 3.1 Ed Ramsden, Temperature measurement, Sensors. Retrieved December 19, 2008. ↑ 4.0 4.1 4.2 Bonnie C. Baker, Designing the embedded temperature circuit to meet the system's requirements, Sensors. Retrieved December 19, 2008. ↑ Bucknell University, Temperature Sensor—The Thermocouple. Retrieved December 19, 2008. ↑ Lakeshore, Lake Shore sensor temperature response data tables. Retrieved December 19, 2008. ↑ Lakeshore, Lakeshore Cryotronics thermocouple wire product description. Retrieved December 19, 2008. ↑ 8.0 8.1 Noble.matthey.com, Johnson Matthey thermocouple wire brochure. Retrieved December 19, 2008. Fraden, Jacob. 2003. Handbook of Modern Sensors: Physics, Designs, and Applications. New York, NY: AIP Press/Springer. ISBN 0387007504. Kerlin, Thomas W. 1999. Practical Thermocouple Thermometry. Research Triangle Park, NC: Instrument Society of America. ISBN 1556176449. Pollock, Daniel D. 1991. Thermocouples: Theory and Properties. Boca Raton, FL: CRC Press. ISBN 0849342430. Notes from a cold junction. This page was last modified on 25 November 2015, at 16:10.